A new collaboration between Sword Art Online and jewelry brand The Kiss is giving fans the chance to get their hands on a dazzling ring and two necklaces inspired by Kirito and Asuna! First up is a silver ring based on the special sword that Kirito wielded in Sword Art Online the Movie: Ordinal Scale. Not only does it mimic the unique structure of the unnamed sword, but it is also set with a blue gem that pops brilliantly thanks to the yellow gold coating. The accompanying ring case’s transparent portion also makes it easy to keep it on display. The ring will be available for 15,000 yen (pre-tax) and will also come with a postcard. The remaining two pieces are simple yet stunning black and white necklaces based off of Kirito’s sword Elucidator and Asuna’s sword Lambent Light. Both come with a rectangular slate inlaid with a gem or motif, plus a miniature charm. A peek at the back also reveals their status as a survivor of the SAO Incident. 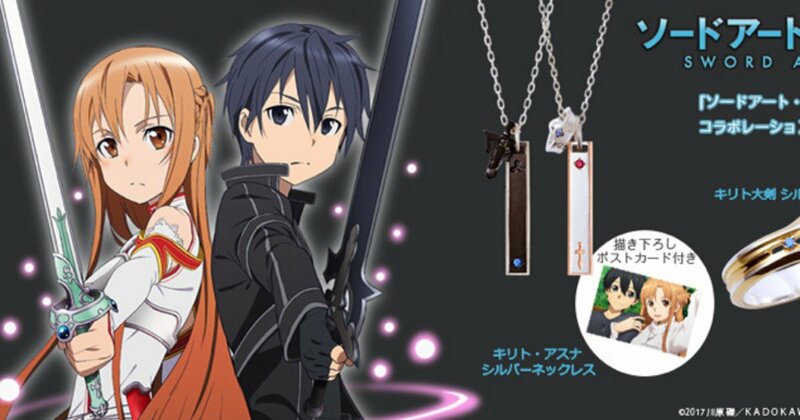 Each necklace retails for 15,000 yen (excluding tax and handling) and comes with a postcard bearing an illustration of Kirito and Asuna. Online shop FanFun Market is accepting preorders for these three pieces until Jan. 7, 2019.